Foot Callus Removal at Home – 10 Best OTC Products + Advice! A callus is an area of skin on the foot that has become really tough. These areas are hard, thick, and can be difficult to remove. They can cause a lot of pain, especially when you’re wearing shoes that don’t fit properly or you go walking or running regularly. So, it’s understandable that you want to know how to get rid of calluses on the feet fast. A deep callus removal requires a product that can buff or shave the area of rough skin away. There are several over-the-counter (OTC) products on the market, called electric callus removers, that do just that. They don’t hurt and are they give you smooth feet instead of dry or cracked skin. Unfortunately, it can be difficult to know what the best OTC product for removing calluses permanently. This in-depth guide will cover ten of the best options so you can feel confident in your decision. We will cover callus shavers, callus gels, callus peels, etc. Whether you have a callus underneath your foot or calluses on the top of your toes, they can be removed. It’s just a matter of knowing which products work the best. We will also cover the differences between calluses and corns, and the symptoms of a callus. Finally, we’ll let you know some home remedies you can use to remove hard, thick skin on your feet. Developing calluses usually takes time. But, it doesn’t have to take long to remove them when you have the right products at your fingertips. 3 What Are the Best Over-the-Counter Callus Removers? 4 What Should I Do After Removing Calluses? 6 Are Pumice Stones Good for Your Feet? 7 Are Callus Shavers Safe? 8 What Is the Best Product for Getting Rid of Calluses at Home? Calluses can be easy to ignore for a long time. Unfortunately, ignoring them will not only lead to pain and irritation but to more problematic foot conditions. First, if you let them go for too long, it may be next to impossible to remove calluses at home. In these cases, you’ll likely need to see a podiatrist. Getting rid of them early will allow you to safely buff them away in the comfort of your own home. So, what’s the worst that could happen with a callus? Most problems with calluses occur if it cracks open somehow, which is possible if it gets too big or thick. People with poor circulation or conditions like diabetes are at an even greater risk for these problems. Most of the conditions and problems listed here are rare. They typically occur when a callus is left untreated for too long. If they do happen, however, you could be putting yourself at risk for more severe issues. It’s better to choose one of the products from the list below to get rid of the callus quickly and take proper care of your feet. Corns and calluses both tend to cause pain and discomfort. They can be easily confused if you’re not sure what to look for. So, how can you make sure you’re dealing with a callus and not its rough-skinned counterpart? Let’s look at some of the key differences between these two common foot conditions. Calluses are traditionally flat areas of toughened skin. They occur due to continued friction on the skin of the foot. Strangely enough, calluses protect your feet. The rough, thick skin that develops is your body’s way of protecting the more sensitive inner layers of skin and tissue. A callus keeps those layers from experiencing extreme temperatures or possible penetration from a foreign object. Calluses most often form on the bottom of your feet. However, they can form wherever there is excessive rubbing (like from your shoes). This core actually points inward toward your foot and can press against nerves and tissue, causing even more pain. In most cases, you can treat corns with specific footwear or cushioned pads. If they become too severe, they may need to be removed by a medical professional. What Are the Best Over-the-Counter Callus Removers? As we get into the top ten removal devices for calluses, you’ll notice a variety of different solutions. All of the products listed here are designed to get rid of calluses as quickly as possible. Some people are more comfortable with things like gels, while others may prefer electric callus removers. To determine which treatment you might be most comfortable with, take a look at the key features listed, as well as some potential pros and cons. Some people can be hesitant to try callus shavers. They are under the impression they will hurt or take away too much skin. On the contrary, electric shavers like the Amope Pedi Perfect Electronic Foot File - Regular Coarse, Blue are one of the best options for foot callus removal. This particular shaver by Amope is a best-selling item and one of the most popular solutions for calluses. It can soften your feet in just a few minutes of use. Plus, you can use it whether your feet are wet or dry and it won’t cause any damage. Instead of actually ‘shaving’ away from your skin, this device actually gently buffs hard, tough skin away. If you have cracked skin or dead skin in addition to calluses, it can get rid of them and leave your feet feeling soft and smooth. It is only of the only devices of this kind that is 100% waterproof. You might find it easier to buff away dead skin in the shower or bath. Now you can without having to worry about the safety of the device you’re using. If you have a hard time gripping things and think you need to apply a lot of pressure, this is a great solution for you. It includes an ergonomic handle that is easy to grip. Very little pressure or force is required when you’re using it, and you won’t need to twist or turn it around to get every exact angle. Let the product itself do the work by quickly and gently buffing away the roughest areas of your feet. In just one treatment you’ll notice results. It’s a great addition to your regular foot care routine. This callus shaver is truly one of the best on the market. You can use it, however, makes you more comfortable, whether that’s in the shower or after. If you do use it in the shower, you can enjoy the added benefit of softened skin. Many other foot shavers require you to soak your feet beforehand. Because this is waterproof, you don’t have to complete that step. Because it only takes a few minutes to use and will leave your feet instantly softer, you’ll love the ‘spa-like’ feeling it provides. Not only does it remove calluses, but it also makes your feet and skin a priority. Check the Price of the Amope Pedi Perfect Electronic Foot File - Regular Coarse, Blue on Amazon! OwnHarmony Electric Callus Remover is considered an electric shaver that can soften skin and get rid of tough calluses on the feet. It offers smooth feet with professional results in just minutes a day. There are no ‘grater-like’ tools included, so there is nothing to be intimidated by. It is completely safe and won’t cause any cutting or nicking of the skin. The device comes with three rollers made of quartz micro-mineral crystals. This gives you a pain-free experience and beautiful skin after every use. Plus, you don’t have to apply any pressure or worry about bending and twisting the device around at awkward angles to clear up your skin. Some skin shavers (even electric ones) require you to use your own strength for them to be effective. This can be good for people with really thick skin. But, it can also give you the opportunity to ‘press’ too hard, and shave off too much. Because of the size of the rollers, they cover 11% more surface area than many other similar shavers. You can ‘clean up’ your skin in a fraction of the time. The company promotes that you can get rid of years of hard, thick skin in just minutes. Once you’ve shed layer after layer of cracked, dry skin, you can continue to use it for maintenance. This is a rechargeable device that can get multiple uses out of one charge. When you do need to boost the battery, it charges quickly so you don’t have to disrupt your regular foot care routine. 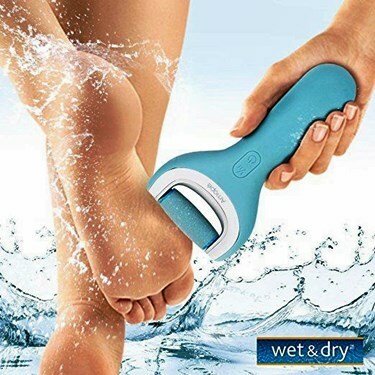 Using this device along with a regular moisturizer is a great way to get rid of rough feet quickly. It’s a deep callus removal that you can use several times a week as part of a normal foot care routine. Because it includes three rollers, it will last an incredibly long time, and you don’t have to worry about constantly buying new batteries. It is economical, environmentally-friendly, and works extremely well to get the job done quickly. Check the Price of the OwnHarmony Electric Callus Remover on Amazon! 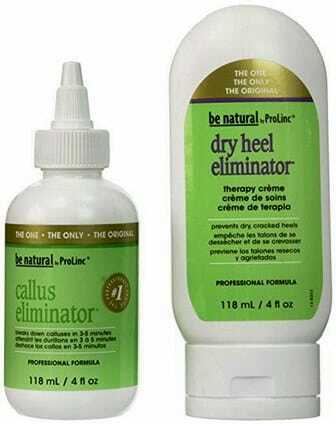 When something is called Callus Eliminator, you expect it to do just that: Permanently remove calluses. Thankfully, this product lives up to its name. When you’re using an electric callus shaving device, you can’t always get to the rougher spots. So, you may want to know how to get rid of calluses on the top of toes, or a callus on the outside of your big toe. Solutions like Callus Eliminator can help with that. Thickened skin isn’t always just on the bottom of your feet. If you have calluses elsewhere on your feet, using a product like this can help to get rid of them effectively. The formula works by actually breaking down the structure of callused skin in a matter of minutes. Once the skin starts to soften, you can use a file or buffer to ‘shave’ the callus away safely. You don’t have to cut into your skin. If you’ve tried files or buffers in the past and have experienced any pain, this solution helps to get rid of it. It primes your skin by weakening the callus, so it can be shaved away without an ounce of pain. 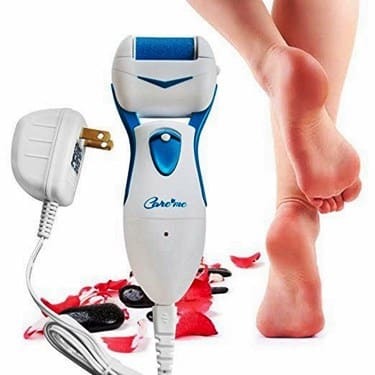 If you don’t want to use an electric shaver and have really been looking for something to break down your callused feet, this is a great option. It works especially well on calluses that have formed on the top of your feet or the side of your toes. They can sometimes be difficult to get rid of. This primes them to be removed easily and quickly, so you’ll notice results in just a few days. Check the Price of the Callus Eliminator Bundle on Amazon! 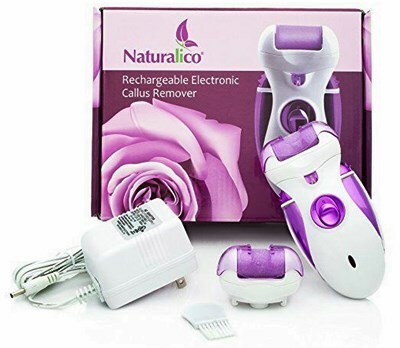 The Electric Callus Remover and Shaver by Naturalico - Best Rechargeable Pedicure Foot Care File Tool - Remove Dead, Hard, Cracked Skin and Reduce Calluses on Feet in Just Seconds - Spa Like Results is designed to buff away rough, thick skin in just seconds. It spins 40 times each second for ultimate exfoliation. Even if you don’t have calluses, it works on dry, cracked feet and rough heels that need attention. It contains a lighted system that lets you know when the device is charged, or when it needs to be charged. It also includes LED lighting so you can clearly see which areas of your skin need more attention. This makes it easier than ever to focus on the roughest parts of your feet and buff away that thick skin quickly. Plus, with two different speeds, you can choose how this product works for you. There is no need to apply extra pressure, just change the speed setting to make adjustments. It’s like a personal spa experience in your own home. This rechargeable device is great for the environment, gentle on your feet, and extremely easy to use and clean. You can keep it at home as a part of your regular foot care routine. Or, take it with you on your travels. It’s extremely portable, and a full charge lasts a long time so you can use it again and again. If you typically have trouble seeing your rough spots, the included LED lighting is a huge benefit. Plus, you don’t have to apply a lot of pressure. Soft, long strokes are the preferred method of rough skin removal when using this device, so it’s a great option for just about anyone. Check the Price of the Electric Callus Remover and Shaver by Naturalico - Best Rechargeable Pedicure Foot Care File Tool - Remove Dead, Hard, Cracked Skin and Reduce Calluses on Feet in Just Seconds - Spa Like Results on Amazon! Many callus shavers are now electric or rechargeable devices. However, sometimes the best way to get rid of rough skin is with something a bit more traditional. This Microplane Colossal Pedicure Rasp proves just that. It is an easy-to-use foot file that can get rid of calluses quickly without pain. Unlike electric shavers, there is no recharging involved in using this simple device. It instantly eliminates thick skin and gently shaves away calluses without cutting or causing any discomfort. The grating feature of the device exfoliates while getting rid of dead, cracked skin. If you’re okay with a more ‘manual’ solution to getting rid of hard skin on your feet, this is a great option. It features the ability to gently shave away calluses with your own strength and speed while giving you full control of the process. It may take a bit longer to get rid of them than with an electric shaver. But, you can take it with you wherever you go. It makes daily foot care much easier and more convenient than many other products. If you’re worried about such a simple device being too rough or causing pain, there is no need to be! Remember, you control the amount of pressure and the angles. If you have sensitive skin or need to go slower, this allows you to customize your foot-filing experience. So, you can do it as often as you’d like to ensure softer skin. Check the Price of the Microplane Colossal Pedicure Rasp on Amazon! Callus peels are an excellent option for getting softer skin and treating yourself to a spa-like treatment. This Baby Foot Exfoliant Foot Peel offers that feeling of luxury, and you can do it in the comfort of your own home. This particular peel is even lavender-scented, for a more relaxing and calming experience. This foot peel pack works through an easy, three-step process. You apply the peel, soak your feet, and wash it away. According to the manufacturer, it only takes a week to remove the dead skin cells from your feet. By the time you’re done, your feet will feel baby soft and smooth. It is made from natural extracts and botanical ingredients, so you can feel safe about using it. Even with regular use, you shouldn’t experience any negative side effects. These botanical ingredients also make the peel smell great, so it really will feel like a spa experience. Unlike things like electric shavers or manual foot files, you may not see instant results with this callus peel. However, many people suggest that after using it for about a week, you’ll start to notice dead skin practically falling off in sheets! The bottom of your feet will become extremely soft after this hard skin is peeled away. This peel will gently exfoliate your skin with each use. There is no additional filing or buffing required. The natural ingredients do all the work, and you get to relax and enjoy the experience in the process. You don’t even need to follow up regular use with a lotion or moisturizer. The botanical formula will work to moisturize your skin naturally. With a name like ‘Baby Foot,’ it’s safe to say that there is a lot to live up to within this product. However, with regular use, it can absolutely give you the super-soft skin you’ve been looking for. Once your calluses have been peeled away, you can continue to use it as a part of your regular foot care routine. It will continuously leave your feet feeling soft and looking beautiful. Regular exfoliation with products like this can help to prevent hard skin and calluses from forming again and again. 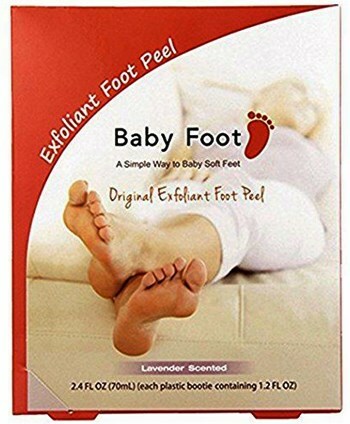 Check the Price of the Baby Foot Exfoliant Foot Peel on Amazon! One of the most popular callus peel masks on the market is the Vena Beauty Exfoliating Foot Peel Mask. You’ll start to notice results in just three or four days. In one to two weeks, you should notice the dead skin of your feet starts to peel away. This will leave your feet smooth, soft, and callus-free! You only need to use the product once to start seeing results. In fact, it’s recommended that you don’t use it more than once a month. Because two treatments come within one package, you get two months worth of masks, but you’ll see results much faster than that. To speed up the healing process of your rough skin, you can regularly soak your feet after using the mask. For a more spa-like experience, try a foot soaking tub with essential oils. The oils will help to keep your skin moisturized while the peel goes to work shedding layers of hard, dead skin. The value in this mask is also its ‘drawback.’ One pack will last you just two months, but it’s recommended that you wait a month between each use. You should experience softer skin and be shedding layers during that time. So, while you’re getting a lot of benefits from a single treatment, some people prefer a spa-like product they can use regularly. If you’re looking for something you can use every day, this, unfortunately, isn’t the right product for you. However, if you’re just trying to get rid of your rough feet and cracked heels as quickly as possible, this is a great option. You can still have regular relaxing soaking experiences after using the peel. You can even create your own foot soaks or use other exfoliating agents to soften your feet as much as possible. Plus, it’s great to be able to see the dead skin start to shed away in a matter of days. There is no additional filing or shaving required. The powerful and safe ingredients within the mask will gently shed away dead skin for you. Check the Price of the 2 Pairs Foot Peel Mask Exfoliant for Soft Feet in 1-2 Weeks, Exfoliating Booties for Peeling Off Calluses & Dead Skin, For Men & Women Lavender by Bea Luz on Amazon! Most electric foot shavers don’t allow you to apply the kind of pressure you may want. If you apply too much pressure, the rollers can stop working. The Care Me Electric Foot Callus Remover gives you more control over how much pressure you want to apply when using it. It has been tested numerous times and claims to be one of the strongest foot scrapers on the market. The rollers are extra large and extra coarse. Obviously, this device is designed for people who have extremely hard or thick skin, and exceptionally stubborn calluses. The Care me Foot Callus Remover provides professional pedicure-quality results at home in just a few minutes. The manufacturer is quick to boost the savings you’ll rack up when you invest in this product. You don’t have to go to expensive salons or purchase pricey treatments to soften your feet. Because this device is so portable, you can take it with you wherever you go. When using any electronic callus shaver, it’s important to be aware of the spots you’re trying to exfoliate. This particular device is extremely powerful and gives you more control. However, that also puts you in the driver’s seat when it comes to how much pressure to apply. If you apply too much force, your skin could start to get hot. Or, you could file away too much. While the powerful aspect of the Care Me device is one of its best features, it’s a shaver designed for those dealing with super thick, hard calluses. If you tend to have a problem with thick, cracked skin on your feet, it’s an incredible product that will give you the power you need without dying out or freezing up. Check the Price of Care Me Electric Foot Callus Remover on Amazon! This electric foot file by Nature Tech is designed to remove dead skin by the second. What makes it unique from other callus removers is that it features rollers that move 360 degrees. That allows it to perform more effectively and faster than many other electronic callus removers on the market. The rollers are also made from micro mineral stone. They gently exfoliate and get rid of even the toughest dry skin without harming your feet. The device uses long-lasting AA batteries. There are no cords involved and no need to recharge anything. That makes it perfect for traveling, so you can have a spa experience wherever you go. It is safe and water-resistant and works better than a pumice stone to exfoliate your feet without cutting them. For best results, the manufacturer recommends that you use it before a shower when your skin might be exceptionally dry/cracked. It is water-resistant, but not waterproof. Using it on dry feet will ensure that you’re buffing away the roughest parts of your skin. One of the best ways to use this device is as a traveling companion. Electronic foot files with cords and charging stations can be bulkier and inconvenient to use when you’re on the road. With this Nature Tech foot file, you can simply pack it in your suitcase and go. You also don’t have to soak your feet in order to make it effective. In fact, it will work better on dry feet. You can then take a shower or bath, and moisturize to finish up the process of smoothing away your hard, cracked skin. This callus remover is powerful, yet portable. It offers the best of both worlds to get rid of calluses and thick skin that could be causing embarrassment and irritation. Plus, because of its rotating rollers, you can reach every angle of your feet with ease. Check the Price of the Nature Tech Pedi Electronic Foot File Callus Remover on Amazon! Emjoi has a small variety of different callus removers and foot care products. But, one of their most popular is the Emjoi Micro-Pedi Nano Callus Remover. 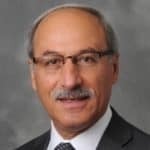 It sits at the top of the company brand for several good reasons. First, it features an ergonomic design. If you have trouble with your grip or moving devices like this around, the handle will help. It fits easily in your hand and offers a comfortable grip while you’re using the device itself. The roller spins 360 degrees so you don’t have to make awkward twists and turns with your hand to reach every trouble spot. This foot file is accepted by the American Podiatric Medical Association. It may be small, but it is extremely powerful. It only takes a few minutes of use for your skin to look and feel better, and for hard calluses to be shaved away safely. If you’ve found it difficult to ‘shave’ your feet before, this little device takes the hard work away. Its size gives way to a powerful motor and unique rollers that pulverize dry skin. This device by Emjoi is portable and powerful. It’s also meant for people who might struggle with heavier foot filers. Or, those who have trouble using their own pressure and strength to effectively get rid of dry, cracked skin. In just a few seconds, you’ll notice the coarse roller gently buffing away even extremely thick skin. It’s a great way to eliminate calluses and keep up with a regular, healthy foot care routine. 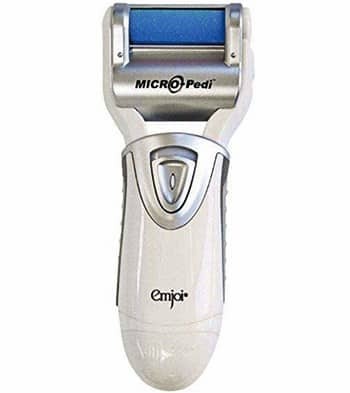 Check the Price of the Emjoi Micro-Pedi Nano Callus Remover on Amazon! What Should I Do After Removing Calluses? Once you’ve gotten rid of hard, cracking skin on your feet, taking care of them is important. If you’re using a cream or peel, many of them already contain moisturizing agents. If you used a foot shaver to get rid of calluses, you should follow it up with a moisturizing routine. It’s not enough to just take a shower or a bath afterward. Proper moisturization will keep your feet from drying out so quickly. One of the best products for daily moisturization if you use a foot file is the Amope Pedi Perfect Daily Moisturizer. You can use it for any type of foot filing, not just the Amope shaver. If you have a favorite moisturizing lotion, you can also use that every day. Finally, you can take care of your feet by exfoliating them regularly with foot soaks and Epsom salts. Foot soaks in a foot basin will help to keep your skin soft. You can even add essential oils, like tea tree oils. They will work to moisturize your skin and prevent possible infections from occurring. It’s easy to ignore the overall health of your feet. But, if you’re investing in one of the products in this article, it’s important to follow up regular use with a healthy foot care routine. Moisturization is key to keeping your skin soft. Give your feet time to ‘breathe’ and air out after using a moisturizing agent. Trapping moisture within shoes or socks can lead to fungal or bacterial growth. Calluses are fairly common. Our feet take a beating on a regular basis. Unfortunately, we don’t always notice that a callus may be forming until it becomes painful. In some cases, people prefer getting rid of calluses using natural remedies. Or, using these remedies in tandem with something like an electronic foot file, gel, or peel. Let’s take a look at a few of the best ways to get rid of calluses at home using ingredients you may already have on hand. One of the best parts about trying one of these DIY methods is that they are usually very safe, and you know the exact ingredients going into them. In many cases, you can use them every day. They will help to soften your skin and add to the spa-like experience of buffing away cracked heels and calluses. Soak a cotton ball or small cloth in apple cider vinegar. Using a bandage or medical tape, secure the piece of cotton to your callus. Remove the next day, and gently exfoliate and moisturize the area. Repeat daily, or as needed to soften your callus until it can be removed. Fill a basin or foot bath with warm water. Add three tablespoons of baking soda and gently stir. Rinse the solution away and gently exfoliate with a pumice stone. In a small bowl, mix equal amounts of sea salt and extra virgin olive oil. Soak your feet in a basin of warm water for 10-15 minutes to soften your skin. Lightly rub the salt mixture over the affected area in circular motions. Continue the rubbing/exfoliating process for several minutes. Rinse the mixture away and dry your feet completely. Follow this process with a moisturizing cream or lotion. Because the salt works as an abrasive, you don’t need to use any type of pumice stone or additional foot shaver with this method. However, if you do, it can get rid of your calluses faster. It may sound strange, but one of the most popular ways to treat a callus at home is with bread and lemon or bread and vinegar. The bread essentially works as a ‘bandage’ or sponge. To use this method, simply soak a piece of bread in lemon juice or vinegar, and rest it on your callus. If you can ‘wrap’ it around the callus, that’s even better. If not, you can use a piece of bandage or medical tape to secure it in place. Leave it for several hours or overnight, then remove. The great part about this method is that you’re in complete control of every component. You can use a bigger piece of bread for a bigger area. You can also choose the amount of lemon juice or vinegar needed. Plus, it’s a quick remedy to soften calluses using two ingredients you probably already have at any given time. Are Pumice Stones Good for Your Feet? If you do any research at all on rough skin or calluses, you’ll probably run into the suggestion of using a pumice stone. Some people are hesitant to try a pumice stone on their feet because they think it may cause damage or be painful. A pumice stone is nothing more than a block of lava foam that has hardened. It is all-natural and is specifically designed to help shed rough, dry skin. This includes difficult calluses. The problem with just using a pumice stone to exfoliate your feet is that it can take a long time, and requires patience and pressure. Using one usually requires several treatments to soften hard skin and get rid of calluses. You will typically need to soften your skin somehow, as well, like with a foot soak. Many of the electric callus removers contain rollers that are either made from pumice or contain similar properties. They provide multiple rotations per second, doing all the work of a pumice stone without all the effort. Plus, they work much faster. Using a pumice stone, you may not see results for days or weeks. With an electric option, you can see a difference in just minutes. Pumice stones are great for your feet. But, if you have extremely rough, hard skin, you may want to start with something more powerful. When your skin has softened and your calluses are gone, you can make the switch to a pumice stone for maintenance and general exfoliating. Aside from the removal products listed in this article, callus shavers and razors have become more popular. They are designed to actually ‘shave’ away calluses on the feet instead of shedding layer after layer of skin. While these razors can be effective, they can also be dangerous. Many manufacturers have taken extra precautions and included more safety features in their razors. However, whenever you’re bringing a sharp, blade-like object to a callus or any area of skin, you could be putting yourself at risk. The major problem with using a razor for calluses is that you might accidentally cut yourself. Just as it can be dangerous when a callus splits open on its own, it can be equally problematic if you’re the one who causes the splitting. If you cut your callus open or any of the surrounding skin, you could start to bleed. Not only could it be painful, but you’re opening yourself up to possible infections. It may even make it more difficult to wear shoes or put pressure on your foot. There are no shavers or razors listed in this article because they still aren’t as popular or effective as most other products. However, if you’ve been thinking about using one, be aware of its safety features. Take extra precautions and be careful not to cut yourself in the process accidentally. What Is the Best Product for Getting Rid of Calluses at Home? It’s easier to get rid of calluses at home than you might think. Any of the ten products on this list can help you to soften your skin and break down calluses quickly. They are all safe, get great reviews, and many of them will change the look and feel of your feet in just minutes. However, our pick for the top product is the Amope Pedi Perfect Wet & Dry Foot File, Callous Remover for Feet, Hard and Dead Skin - Rechargeable & Waterproof. The Amope device can be used on wet or dry feet. You can even take it in the shower with you, which is rare for an electrical shaving device. Because of this feature, you can soften your feet and shed away layers of skin at the same time. It is also extremely powerful. But, you won’t risk cutting your feet in any way. A single charge will last a long time, and you can continue to use it even after your calluses have been removed. If your shoes are too tight, this is likely to be one of the main causes of the problem. If you don’t want to buy new footwear, invest in the best shoe stretcher. It’ll help to free up some extra room in your shoes so you can avoid calluses in the future. We hope this guide has been helpful if you’ve been suffering from hard, cracking feet and calluses. The sooner you treat the problem, the easier it will be. Try one of the products listed here, or a home remedy of your own to safely and quickly eliminate calluses from your feet, and leave them looking soft and healthy.